If you’re seeing tweets or Facebook posts from conference participants out of China, don’t get too excited. This isn’t the start of a big policy change. Facebook and Twitter are usually blocked by China’s firewall, but people who are attending the Fortune Global Conference in Chengdu are getting a glimpse at what digital life would be like if China allowed use of the popular social networking sites. 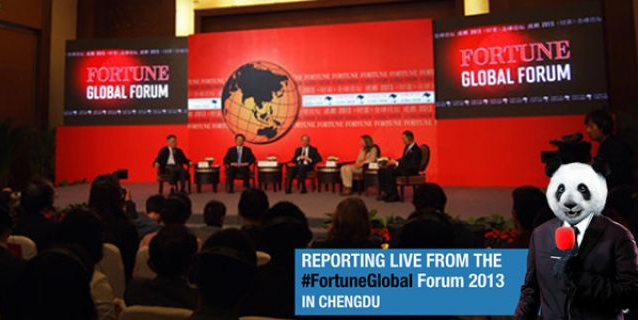 The Fortune Global Conference attracts high-octane Fortune 500 company executives, and it’s a big step into the spotlight for Chengdu, a city of 14 million that’s not as well known as former conference hosts like Beijing, Shanghai, and Hong Kong. Allowing Facebook and Twitter seems like it would be a good move, since it demonstrates that China can be flexible and that it may be developing a less stringent attitude toward social networking – but if you look closer at the level of access granted, it’s pretty clear that this is a fairly tiny, empty gesture. Hispanic Business reports that access to Facebook and Twitter remains tightly circumscribed, so only participants in the conference’s Shangri-La Hotel location can log on and post. Conference participants staying in other hotels are not allowed to log in from their rooms – just the Shangri-La. The people who are allowed on Facebook and Twitter, including the press, are encouraged to use them to raise the conference’s global profile – and the conference created the hashtag #fortuneglobal to spur discussion. 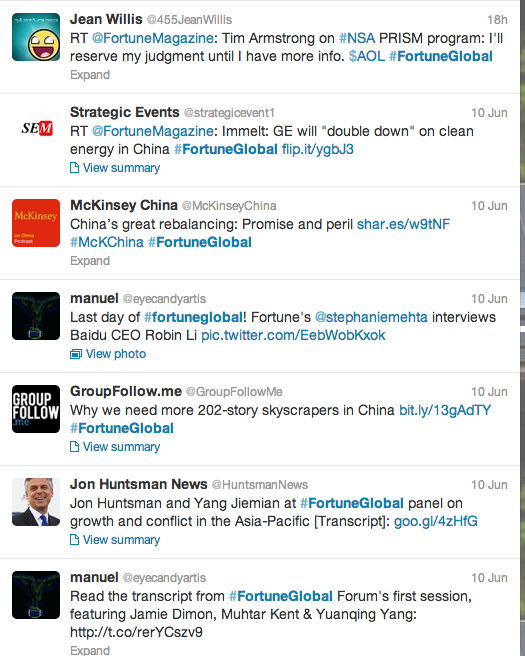 Just from a preliminary glance on Twitter, you can see that most of the participants in the #fortuneglobal discussion are members of the foreign press and multinational companies like McKinsey, which makes sense, since it’s not like the Shangri-La is condoning hotel employees who aren’t part of the festival to join in the fun. And that’s just how Chengdu wants it. Foreign money can come in and China will let the big wallets have their fun using social sites and raising their profile … but this doesn’t have anything to do with changing the government’s attitude toward its own citizens having access to these U.S.-based social networks. This isn’t the first time China let Facebook and Twitter in; press could use the sites during the 2008 Beijing Olympics. It likely won’t be the last time either: Nanjing is considering allowing access for the 2014 Youth Olympic Games (with a Twitter account ready to go). But these incidents speak more to China’s desire to attract foreign capital than it does to its desire to allow more Internet freedom. There are countless examples of Chinese censorship to confirm that this Chengdu opening is just a performance for foreigners. For instance, China censored Wikipedia in preparation for the Tiananmen Square anniversary just days before the Chengdu conference began. And the BBC recently accused the Chinese government of blocking broadcasts. We’ll have to enjoy the momentary glimpse into the closed-off country while we can, and hope that the reins will eventually loosen.